The sport of yachting and Rolex watches have occurred together since the 1950’s. Rolex watches are an important component to the life of a dedicated mariner, for a Rolex equates a mariner’s values for precision and excellence. 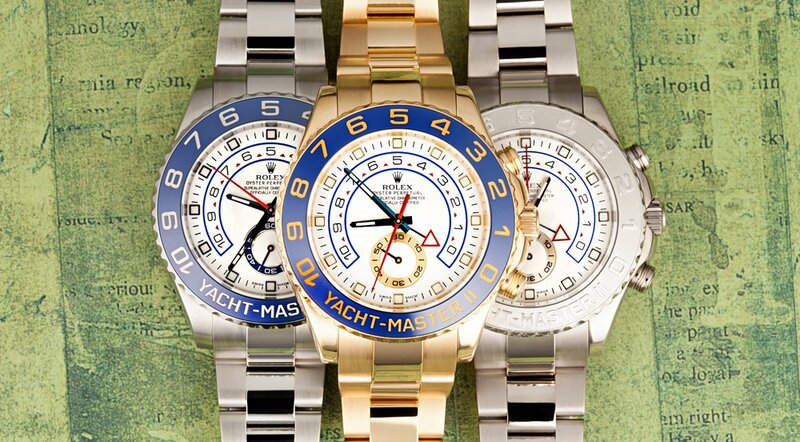 Rolex Yachtmaster was made for those in the Yachting Industry. Rolex’s Yacht-Master watch model is specially designed for yachting and is the perfect fit for any sailor. Rolex’s newest model is the Oyster Perpetual Yacht-Master II, a watch uniquely featuring 4160 movement, programmable countdown, and mechanical memory. The Rolex Yacht-Master II comes in three versions: one with a steel and Everose gold case, blue Cerachrom insert in ceramic bezel, and snailed pink gold second counters, a yellow gold case version with blue Cerachrom insert in ceramic bezel and snailed pink seconds counters, and a white gold and platinum case version with a platinum bezel and snailed white gold second counters. The Yacht-Master II is simultaneously practical and elegant. The legible dial contains minute and second hands that can be easily seen at a glance, perfect for a busy sailor preparing to cross the finish line. A triplock winding crown Oyster case provides shining beauty and allows protection from water (up to 100 metres/330 feet) and dust. The model comes with a bidirectional self-winding via Perpetual rotor, certified Swiss chronometer (COSC) precision, and a paramagnetic blue Parachrom hairspring oscillator. Lastly, the most innovative aspect of this model is the easy-to-use, repurposed bezel with a unique functionality. A bezel normally operates independently from its internal mechanism, but in this design the two aspects work together. The bezel is what allows the programmable countdown to be synchronized to the start of the race. In terms of aesthetics, the Yacht-Master II contains an elegant, 44m Oyster case crafted from either 904L steel and 18 ct Everose gold, 18 ct yellow gold, or 18 ct white gold. The white-colored dial contains either attractive snailed pink gold, yellow gold, or white gold second counters. The stunning Oyster bracelet is set in either 904L steel and 18 ct Everose gold, 18 ct yellow gold, or 18 ct white gold and contains an Easylink comfort extension link. So whether you are a recreational sailor or a habitual racer, the Yacht-Master II encompasses your every desire to be precise, excellent, and distinguishable.